TU Dortmund University DAAD STIBET Graduation Scholarships 2019 for Doctoral & International students. 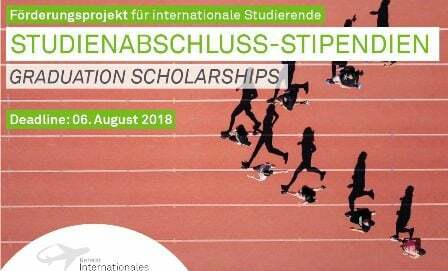 Quaterly, TU Dortmund University offers graduation scholarships to international students from the DAAD project STIBET I. The graduation scholarship is meant to support international students finishing their studies who are in financial hardships by no fault of their own. Graduation scholarships can only be provided to international students and doctoral candidates who achieved good academic performance, have registered their thesis and are in financial crisis. Please submit your application to the International Office on time via mail (Emil- Figge Str. 61, 44227 Dortmund). You can also drop your application off at the after-hours mailbox located next to the main building of the International Office or at room 2019B or personally to Ms. Wasila Al-Dubai.